I have a lightning storm coming in fast, so I’m going to have to be quick. Friday, I have a guest post scheduled for you. 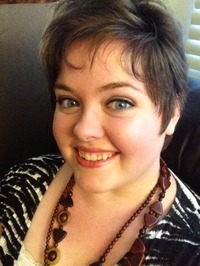 My guest blogger is none other than the lovely and amusing Laura Oliva. She has written something not too long and not too short on staying creative in the writing process. Saturday (and maybe part of Sunday) I will be out of town. There is a big family shindig several hours drive from here and I will be playing chauffeur to some fun relatives, while another of the bunch of us foots the bill. I love to drive, I wanted to go on a road trip, and someone has offered to pay for me to drive them somewhere I wanted to go anyway. Not something I was going to say no to. Hehe. I will be using another song from that play tomorrow for Mirth and Music Monday, but this one is a ton of fun as well. Oh! If I’m raving about a play I should probably tell you what it is, huh? It’s called Once Upon a Mattress. A very funny and silly retelling of The Princess and the Pea. One of my favorites, really. My parents have a DVD of it, and every once in a while I have to borrow it again. So, out of curiosity. (This is off the wall, but) Is there anything in particular one of you would like me to write a post about? Any questions you would like answered, a topic that needs my spin, an idea that you want my perspective on? I Have Scheduled My First Guest Blogger! I am sitting here sipping hot tea, thinking about the day I had. It wasn’t anything unusual. Actually, it was a rather typical day. I woke up a little later than planned due to the fact that we both forgot to set an alarm. After getting up and putting on my robe I went and let our female Labrador out to do her morning business. While she was out, I too handled my morning business; then swapped dogs and poured myself some cereal. The other dog got let in and I started eating my first breakfast. I usually have two breakfasts. One to take care of the morning’s urgent low blood sugar, and the second to provide me with the staying power of lots of protein. This morning however, I was about half way through my bowl when my phone’s calendar made it’s all too happy little sound. Upon checking what it was so perky about I about did a spit-take. I was supposed to be driving an Aunt and my last remaining Grandmother to a meeting…15 minutes from then. I mentally took review of my situation. So I scarf down my cereal (at a speed which would have shocked all members of my family, as I am renowned for eating at a speed which would rival that of a sloth’s). Then it’s run into my bedroom, flick on the light (apologizing to my still slumbering husband), and begin rifling through my shirt drawer looking for something which would be comfortable, but kind of nice looking. I’m dressed, hair is done, teeth are brushed, and I arrive to pick them up just a few minutes late. We make it there at an OK time, and have to wait anyway. The meeting went well. Everything was taken care of with good humor and the lady went out of her way to be helpful. It was actually pleasant. Afterward we did lunch at a local A&W (amazingly none of us ordered root beer…is that legal?). While dropping them off again, we discussed an upcoming family get-together and decide that we will all go together. It’s a several hour drive both ways, so essentially ROAD TRIP! After getting home I tool around on social media for a while, do a little reading, then decided to ward off a threatening headache by lying down for half an hour. Well, I made it into my bed, and was technically lying down. But instead of going to sleep, started playing around on Twitter. One thing led to another and I invited Laura Oliva to write a guest post about staying creative in the writing process. I’m not sure how I got there, but I’m glad I did. She will be my first guest poster, and if all goes reasonably well, I will most likely start inviting more writers to borrow my blogging mic. I actually have a few other people in mind, and may be hitting you up for posts on your advice to novice authors, tips for people new to social media, or something just plain humorous. I’m not sure if it will become something that’s on a schedule, or if they just get popped in whenever I feel like it. Realistically it will most likely be the latter, since calendars and I seem to have a love-hate relationship (as evidenced by this morning). Anyway, if I don’t give you a holler in the next few weeks, and you think you would like to write something for my hand full of loyal readers, please feel free to get hold of me. I would be open to posting anything interesting, helpful, or funny. Here’s hoping this new adventure isn’t as catastrophic as if the Hindeburg crash-landed on the Titanic right next to Krakatoa. 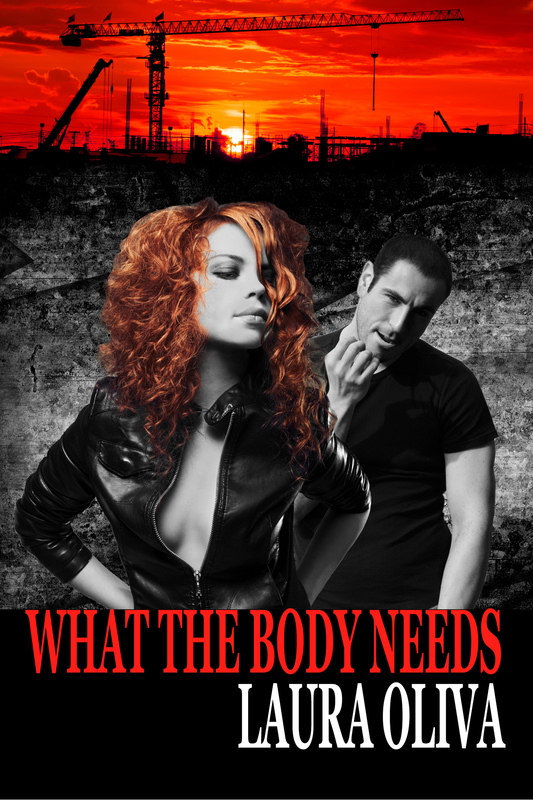 The Cover Reveal For Laura Oliva’s What The Body Needs! So here is the second post which I warned you about. This one is all about my drinking, swearing, fun on the outside, tough on the inside friend Laura Oliva. I write tender love stories about tough people. You won’t find any candy-coating here. The men are men, the women are badass, the dirt is dirty, the whiskey is strong. Things aren’t always roses and sunshine. But sometimes life’s more fun that way. I quoted this from her blog Writing In The Night. She has finished writing her second novel, and received the cover art for it a couple days ago. Laura is super excited about it, and couldn’t wait another week to get it out there for all her fans to see. Jak O’Mara is a survivor. She’s survived in her father’s construction company. She’s survived in the boxing ring. And she survived the brutal attack that left her permanently scarred. For the last five years, she’s tried to convince everyone -including herself- she’s no victim. But with the apparent return of her unknown assailant, the life she’s rebuilt crumbles overnight. Ex-cop Marcus Cutter has his own scars, they just don’t show. Following the violent death of his younger sister, he fled his old life in disgrace. After almost six years, “rock-bottom” feels a lot like home. As Jak’s new bodyguard, Marcus is forced to return to the city -and the memories- he’s tried to forget. All he wants is to do his job, but Jak isn’t what he expects. When he’s with her, he finally feels something besides pain. When the danger escalates, Jak decides it’s time to take matters into her own hands. She’s going to find who’s after her, no matter the cost. Marcus knows he has to protect the woman who’s made his life mean something again. But how do you protect someone who’s convinced they have nothing left to lose? Laura is all over the internet. You can also visit her book page on her site here. I think she’s also on pintrest and something else, but my poor old computer is telling me it’s had enough of looking up social sites today so you’re on your own there. I enjoyed All That Glitters, and I can’t wait until What The Body Needs is also in my Kindle PC (and on my phone. Cause, really, you never know when that grocery check-out line will last more than two and a half minutes. lol). It was a very good vacation from blogging. It was kind of freeing to spend a few nights just picking out cool stuff written by other people and telling you why it intrigues me. But now, we are back to our regularly scheduled programming. 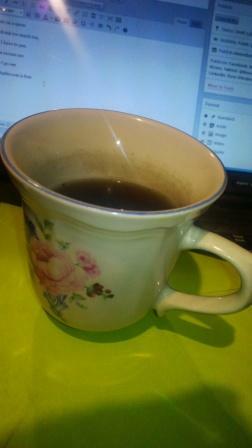 First, I want to tell you a bit of what I did to refill my mental bucket of inspiration. On that note: Here’s a link to her first book All That Glitters on Amazon. Here are some of the better photos I snapped on Thursday. 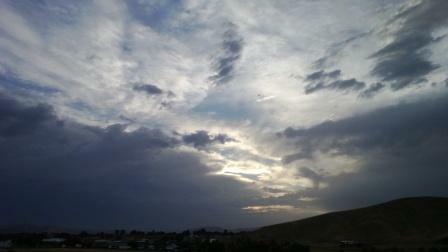 I just couldn’t resist stopping to take a few photos as the storm started rolling over the landscape. 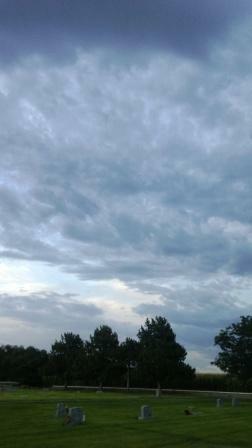 Here’s that storm from a slightly different angle. It’s a little closer now. 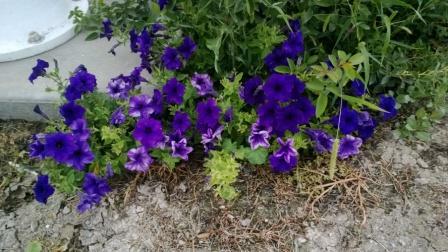 These lovely petunias were growing at the base of the flag pole in the cemetery. Another duo of poems from my shortly to be published book of bathroom poetry. Please let me know what you think about these two. To read the other poems I have posted on this blog you can go Here, Here, and Here. At a friendly prompting by Laura Oliva I took a peek at the formatting instructions on Smashwords.com. I had been stressing about how to format my book of poetry (procrastination to the extreme! ), and she suggested it as an easy to understand set of instructions that translate well to Amazon. After getting onto Smashwords I took a look around. And all I can say is Wow! I thought Amazon was the big kid on the block. So, now I am going to take a few days to familiarize myself with this new site, and see if I can get up the courage to take the plunge into publishing my own work. By the way, Laura’s first book has just come out! It’s a romance novel entitled All That Glitters.